I have 5 monitors on my master (server) computer. I have my client computer which has one screen above the master monitors. Synergy is viewing all the master monitors as "one" top monitor, but I only want one monitor to act as the "transfer monitor". Is there any way to do that? Thanks! Hi @symless_noobie. How are the 5 monitors arranged? Which of those 5 monitors has the client monitor on top of it? 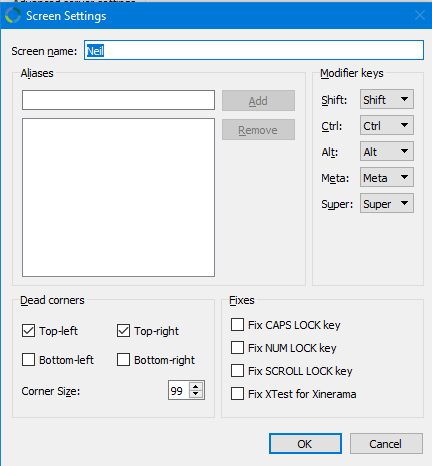 You can try to enable Top-left and Top-right Dead corners. 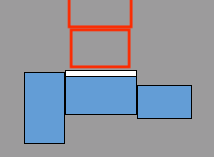 Then, set the corner size to fit/route the open side of the server monitor as the the middle monitor. The value on the corner size is based on pixels. Sadly, that did not work... It still treats all of these monitors as "one screen". 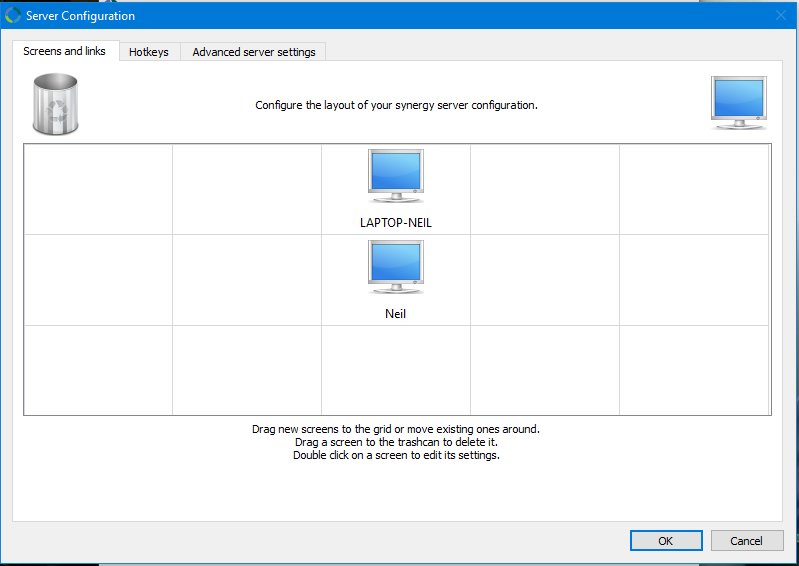 Can you share a screenshot of how you configured the Server Configuration? Can you also post a screenshot of both machine's Synergy interface? 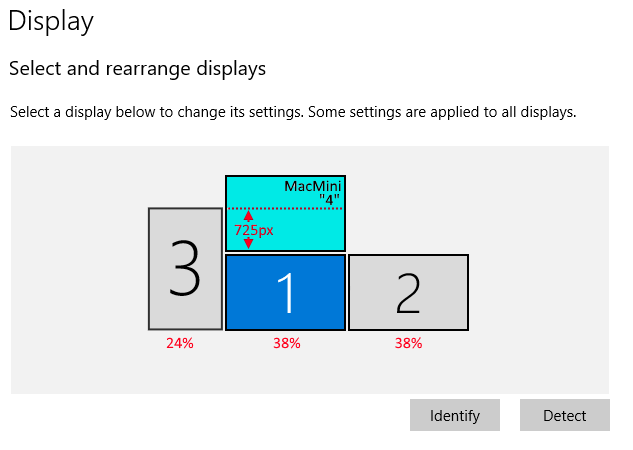 Also, what is the screen resolution of each of your monitor? You can check the resolution for each monitor faster by opening a browser on each monitor and go to this site. I apologize, I got busy and haven't had adequate time or energy to respond go this post. Still haven't fixed the issue.. I'm using a USB to DVI and HDMI plus a USB to VGA, but that shouldn't be a problem should it? where can I find the settings program? My Host has 3 Monitors, from right to left: MacBookPro, MiniDSP connected, HDMI Connected. My Client is above the middle Monitor, but the only way I can move the mouse to the client is via the left monitor. Down to the host it is so, the left corner goes to the left monitor, the right corner goes to main monitor which was at the beginning the MacBook and at the moment the middle monitor. But it doesn't work as intuitiv as it was before, when the client was right from the MacBook. Hey, is there a salution to this problem yet? 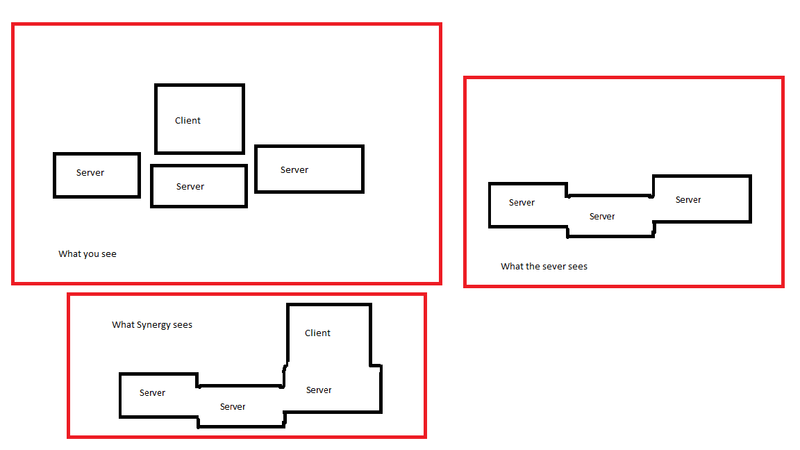 i added a picture of my setup, H screen are the hosts and c are the clients. The most left C is a laptop, it works fine but the oonly way to get to the 2 right clients is to to get by all the hosts screens. Can some one help me, or is it just not posible? the most middle screen is my prime screen. First off, I want to express just how much I enjoy this product. It makes life so much easier! Currently I’m using it to control my laptop using my desktop. My desktop consists of three monitors and my laptop is plugged into a fourth on its own(not attached to my main desktop at all, only my laptop). My ideal usage of your fine application is to only hop over to my laptop when I mouse directly off my center monitor. At the moment, its only allowing me to mouse onto my laptop from my two side monitors although it will mouse back onto my main monitor from the laptop monitor. I’ll attach some pictures so your team can get a feel for my current setup. I hope the above may assist you in anyway and we can get this application setup the way I’d like. P.S This was an email to the support team originally although they never got back to me. That does not help ... but I have found the problem now! My configuration until yet was the first Screenshot, where the left Monitor was the highest (as it is in real) and it was only possible to go with the mouse to the left monitor and then above to the second computer. 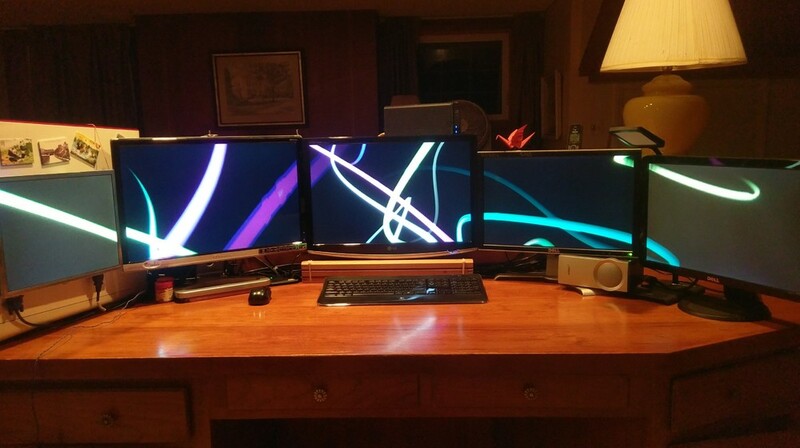 With the new configuration it is possible to go from the middle Monitor up to the second computer. Disadvantage that the mouse position from middle to left monitor is not correct. I have exactly the same Situation as Cupropituvanso Draco with the left higher screen..
Is there a good place to generally ask for advice on complex monitor/host/client configurations? I have a pretty complex arrangement myself and would really appreciate some specific guidance. Should we just keep hijacking this thread? Start new ones? 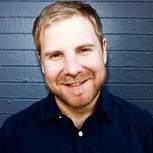 Move to Slack? I'll do whatever is easiest but I would greatly appreciate some help with my layout!! Hi, while looking into this problem myself I have "learned" something about how synergy and your systems' internal monitor setup work together. I am currently using the beta version but I think it should follow the same rules on ver 1. 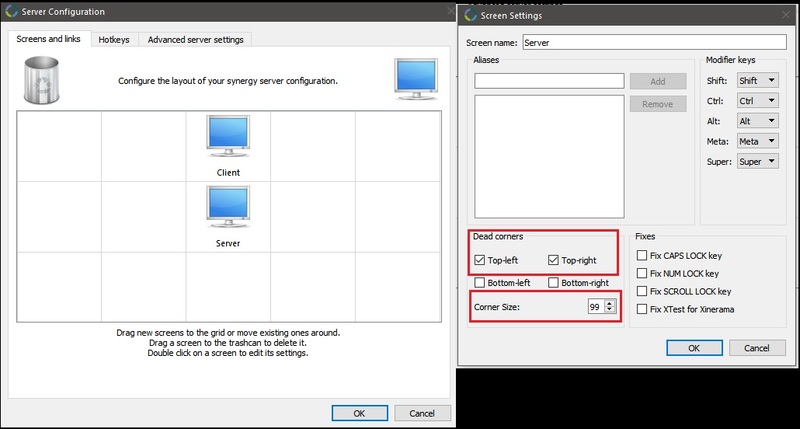 Since synergy "sees" a multi monitor set up as one monitor it uses the monitor that is arranged closest to your client computer as the connecting screen. So if you have monitors of different sizes and have them arranged in your screen setting so that the cursor moves from one to the other in relation to how they are positioned in the world then whichever screen is closer to the client screen (in virtual space) is the connecting one. I too ran into the same issue using 1.10.1-stable-8941241e of only controlling the 'top' computer from the border with the highest pixel height. 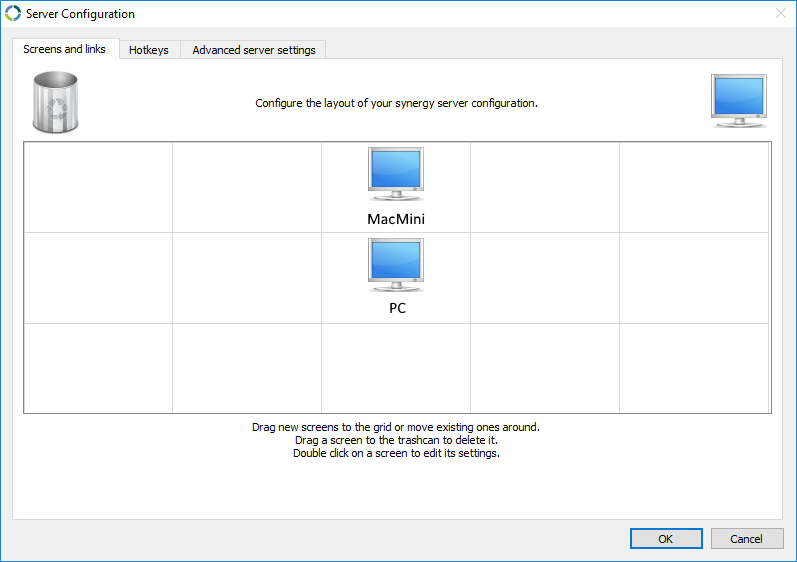 When I had a tall left monitor, I could only navigate to my top synergy configuration when I dragged my cursor from Monitor 3 (below) and it would come up to Monitor "4". 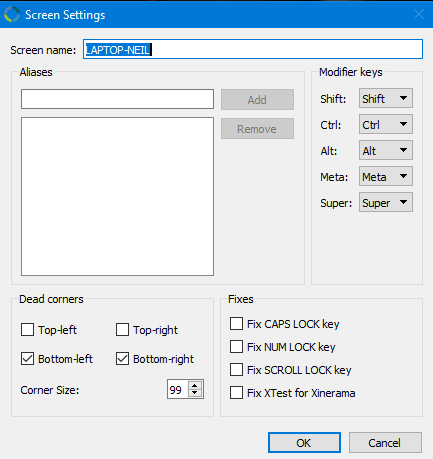 I was able to find a reasonable workaround using percentage screen zones in the TextConfig for Synergy and cursor border proximity event and manual cursor movement with AutoHotKey on my server (running Windows). 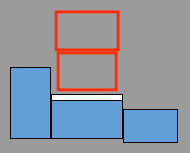 Where with the default configuration in Synergy, the stacked monitor configuration would only allow passage from Monitor 3 (top) to up to 24% (1200px/5040px) of Monitor "4"'s bottom. 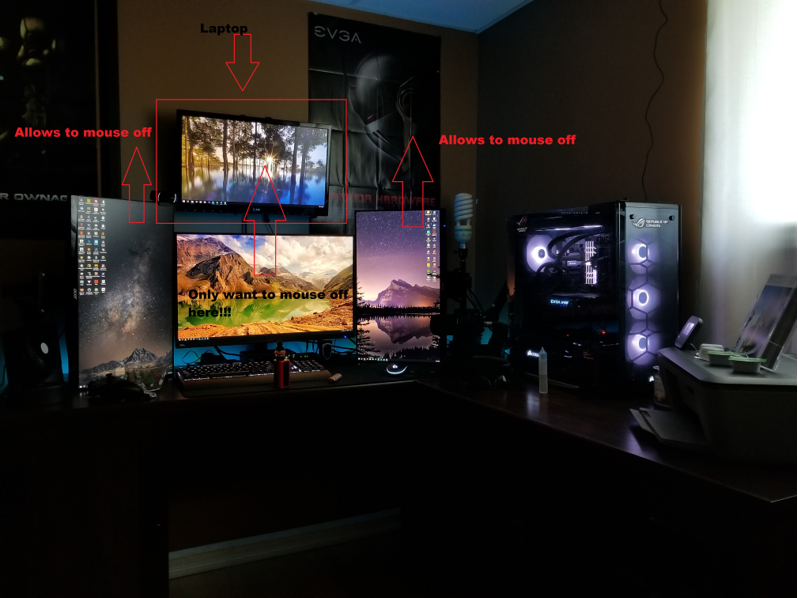 When moving down from Monitor "4", which ever percentage of the screen I left from would end up on that respective monitor, allowing navigation from Monitor "4" down to any of my other 3 monitors. ;Tooltip, % "Monitor" i ": top edge"
I then only wanted to do the 'jump' when above my Monitor 1 and I had to measure how far to 'jump'. I measured based on a printscreen of my entire desktop only to find out that the label for the monitor in AutoHotKey doesn't necessarily match the label in your system. To determine what to set 'ActiveMonitor' to above, I was able to uncomment the tooltip (by deleting the ';') to show which one I was looking for. Set which monitor to jump and how far to jump (in px) in the `;UPDATE THESE` section above. Now I can drag my cursor from Monitor 1 to Monitor "4" and it's scaled nicely. Sometimes my cursor jumps in at the red dotted line, and I expect that's just how the AutoHotKey is firing the event based on how fast I move the cursor. It's still WAY better than needing to change my logical layout in the computer and it allows me to navigate much easier. Please feel free to follow up with refinements to the 'WatchMouse' above and perhaps there's a way to make it more generic to other configurations.